When winter is gone, spring comes to relish the rewards of hibernation upon the masses. 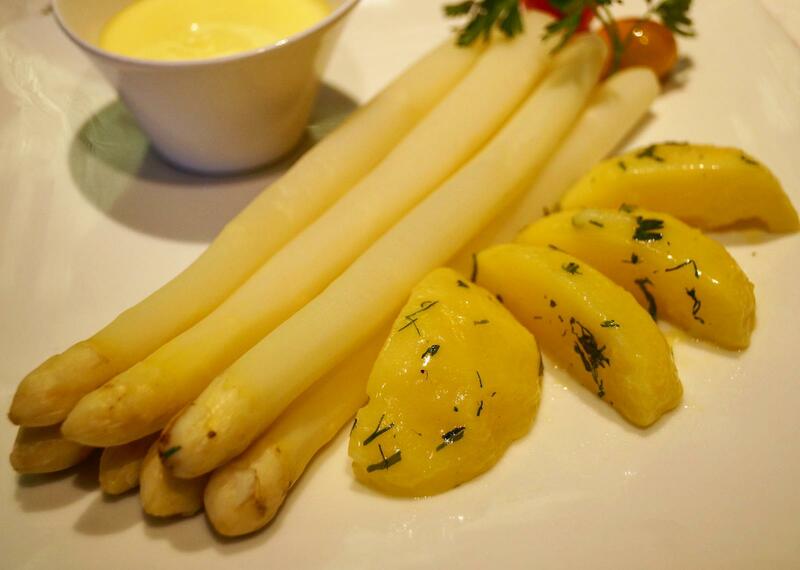 For German specialist restaurant Brotzeit, that comes in the form of its white asparagus menu, here to ring in the spring season with a bumper crop of vegetables, often known as “white gold” to perk up their usual Bavarian selection. In line with their philosophy of eating together, one of the main dishes conceptualised by Brotzeit Group Executive Chef Wolfgang Ranner was the Spargelplatte (White Asparagus Platter, $79). Comprising a whopping 400 grams of white asparagus (approximately 8-12 sticks) in hollandaise sauce, served with black forest and gammon ham, smoked salmon, poached eggs and parsley potatoes, the Spargelplatte is the ideal dish for enjoying with friends and family placed in the centre of the table, its meats rich in flavour and pairing well with the white asparagus. 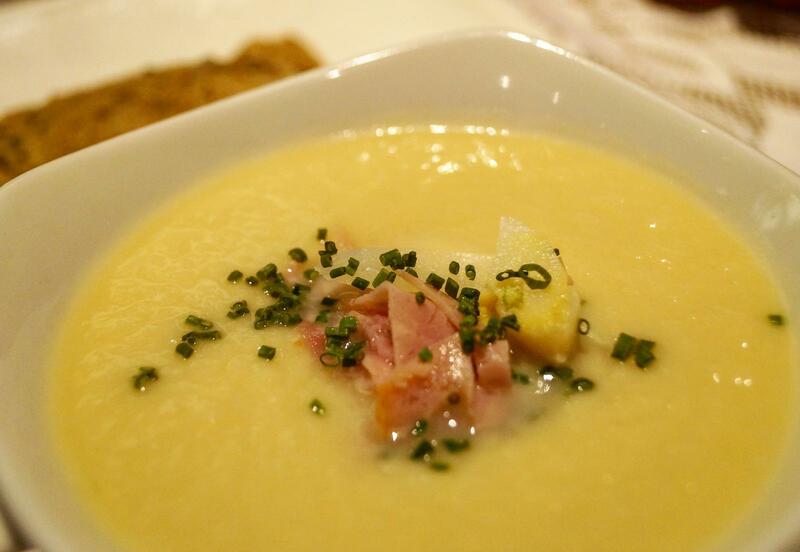 White asparagus has been cleverly incorporated into every aspect of the menu, starting with delicious appetizers comprising of the Spargelsuppe (White Asparagus Cream Soup, $9) and Spargel Im Speckmantel (Bacon-wrapped White Asparagus, $9). While simple, the cream soup filled us with warm, homey feelings, the cream and mild taste of the asparagus coming together elegantly, topped with gammon ham for a little flavour and brown bread to soak up the soup and add a little crunch. 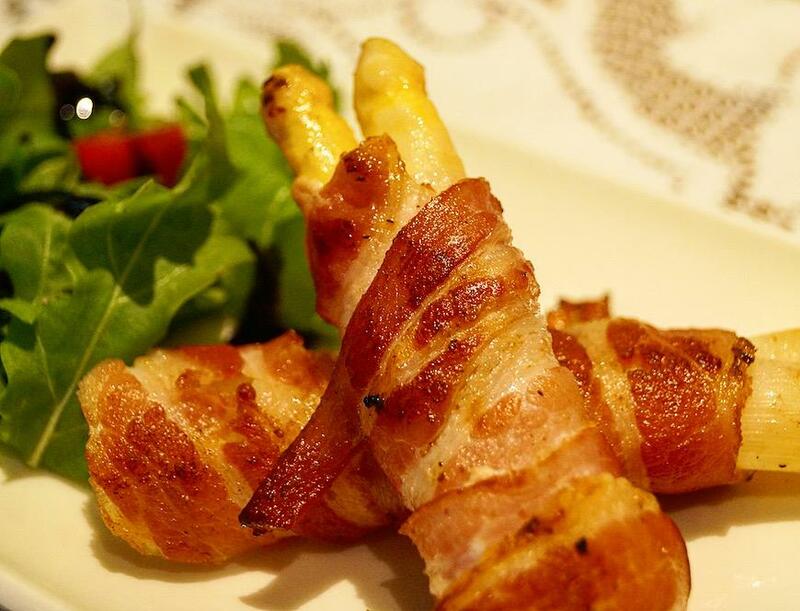 Meanwhile, the bacon-wrapped asparagus convinces us that it is meat that goes best with asparagus, with the well-cooked salty bacon balanced out by the asparagus, well-matched and perfect for whetting our appetites for the rest of the meal. 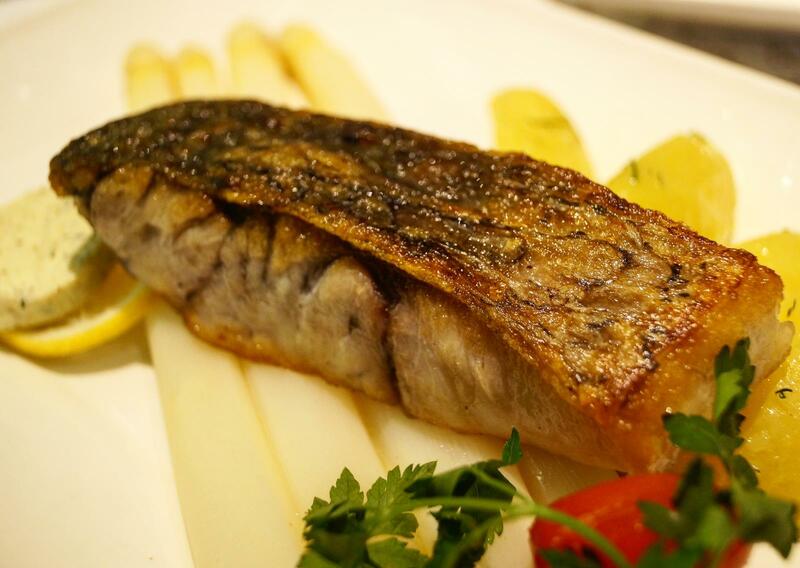 A total of three mains are available on the menu, with Der Spargel-Klassiker (Classic White Asparagus, $28), Spargel Mit Rinderfilet (White Asparagus with Grilled Beef Tenderloin, $39) and Spargel Mit Barramundi (White Asparagus with Pan Seared Barramundi, $32). Der Spargel-Klassiker is exactly as it suggests – 250 grams of white asparagus plain and simple, served with a creamy hollandaise sauce that butters the asparagus right up. Between the Spargel Mit Rinderfilet and Spargel Mit Barramundi, we personally preferred the former. 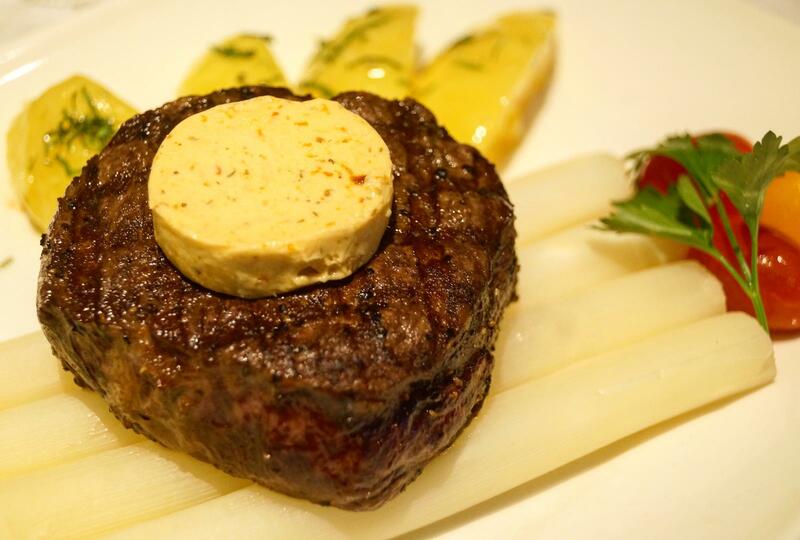 Because of the relatively milder nature of white asparagus, it takes a lot more of a distinct flavour to match it with well, and the grilled beef tenderloin served exactly that purpose, easy to cut and brimming with delicious meaty juice that only added to the heavenly pairing. The locally caught barramundi on the other hand, was fine, but was no doubt outshone by the Rinderfilet. We ended off with dessert, in the form of the Zitronen Käse Creme Mit Spargel (Deconstructed Lemon Cheese Tart, $10). 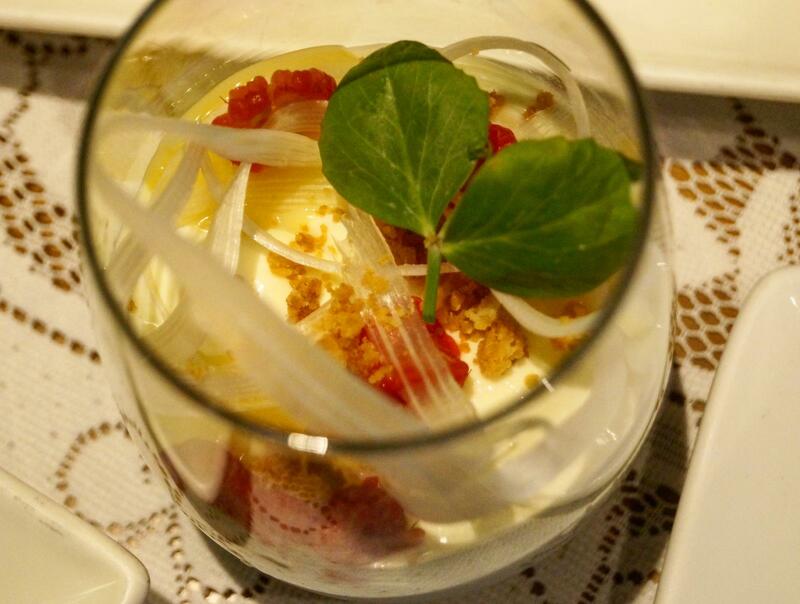 An innovative way to serve up white asparagus, the cheese tart utilised the asparagus by slicing it into ribbons, and adorning a light, lemon cream cheese bed with raspberry rings for a sweet finish to the meal.